Ghana’s Aduana Stars secured their first win of the 2018 CAF Confederation Cup group stage after beating Congolese side AS Vita Club on a wet afternoon in Dormaa. Strikers Bright Adjei and Yahaya Mohammed scored two early first half goals to give Aduana a 2-0 lead before Ngonda Muzinga reduced the deficit. But his goal was only a consolation in the end as Aduana fought hard to secure victory. 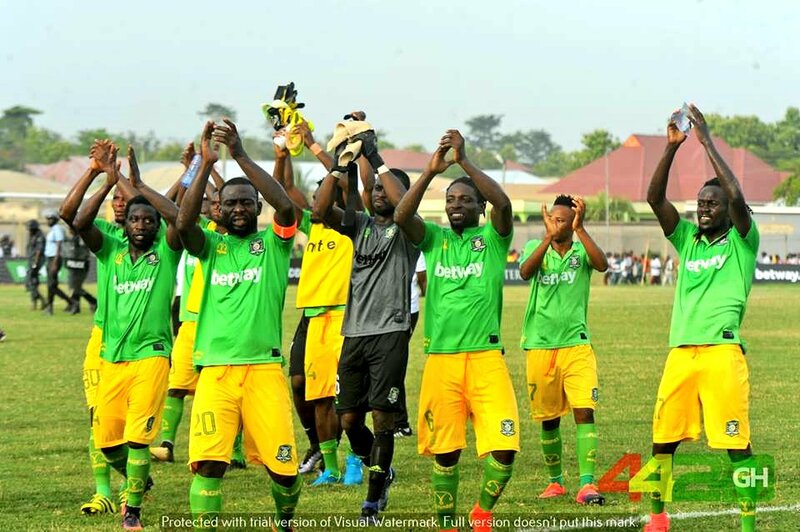 Aduana Stars started the brighter of the two sides and for a team that last saw competitive action some 43 days ago, the sharpness of the players showed no signs of rustiness. Yahaya Mohammed, roped into the starting line up after the favored Derrick Sasraku was sacked from the team for indiscipline, wasted no time in making his presence felt; aerially dominant and silky in movement. It took 4 mins before Aduana stung first; Yahaya played in the lively Bright Agyei who stumped it past the on rushing Mudekereza Machuma in goal for Vita. The collision led to Adjei being substituted early after he sustained an injury in the process. Aduana doubled their advantage through some delightful piece of football just seven minutes later. Zakaria Mumuni, Aduana’s creative spark up to this point, played a beautiful one-two with former WAFA teammate Emmanuel Boateng before releasing Justice Anane down then left flank. His initial cross was missed by Adjei before Caleb Amankwah collected the loose ball at the other flank before sending an inch perfect cross which Yahaya Mohammed headed past the Machuma. Vita were shell-shocked and made their experience count. They began to retain possession as they slowly whole from their slumber. Their first chance came the way of Ducapel Moloko who sent his shot into the side net after Joseph Addo covered his near post. But Vita were not to be denied the second time with a brilliant free-kick routine that Joseph Addo should have saved. Free-kick outside the area is shifted to left back Ngonda Muzinga who squirms a shot under the Aduana Stars wall before the ball bounced awkwardly past Joseph Addo. Aduana went into the break with a deserved lead but the momentum was with the Congolese. After recess, Vita continued to dominate; Aduana’s lack of match fitness beginning to tell. But the introduction of experience legs Emmanuel Akuoko ensured Aduana’s game management was superb. Vita were restricted to shots from outside the box – Makusu Mundele rounding the keeper once but struggled to find any of his teammates in space. Oba Ikama had the chance to score a blinder but his miss did not matter in the end as Aduana wrapped up their first win of their CAF Confederation Cup campaign and move joint top Group A with 4 points ahead of ASEC Mimosas hosting Moroccan side Raja Casablanca later in the day.